In my City Talk column today detailing reasons why Savannah should be encouraging more residential density downtown, I touch again on the massive demographic shifts that we’re seeing in some neighborhoods in Savannah. If you want to get a sense of the dramatic swings that we’re seeing in terms of race and total population, check out this interactive map for individual Census tracts at the New York Times. That’s right — the number of white residents in my tract (which doesn’t align neatly with any existing neighborhood boundaries, btw) almost tripled in that 10 year period. At the same time, the number of black residents declined by a third. There is abundant evidence that trend is continuing, and I’d bet a large sum that white residents now outnumber black residents. Bad public policy continues exacerbating the exodus. More residents will be displaced by the city of Savannah’s shameful and cynical plan to demolish historic homes that have been rented to black families for up to 130 years and build a new Central Precinct. The fact that this destruction of modest, affordable, and historic black-occupied homes is being done on Martin Luther King, Jr. Boulevard raises the move to the height of absurdity. So we have a rapidly gentrifying neighborhood, and the city is pursuing policies that will make it gentrify even faster. And we’ll likely one day see that portion of MLK as a sharp dividing line between wealthier mostly white residents and poorer black residents. This process might take another 20 years, but it’s clearly well underway. 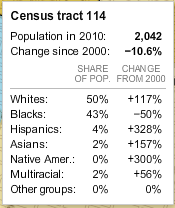 And demographic trends like this are hard to reverse, much less halt. So those people who are leaving the neighborhood — where are they going? As I note in today’s City Talk, across the country we’ve been seeing a sharp rise in suburban poverty. In part, that’s because people already living in the suburbs experience economic hardship during and after the recession, but we’ve also seen more poor and economically vulnerable people move to the fringes of cities and metro areas. Check out a fascinating piece in Business Insider published just this week: The 15 US Cities Where Poverty Is Soaring Fastest. As I note in today’s column, the suburbs are especially bad places for poorer Americans to live because of the cost of transportation and the limited transportation options. Atlanta saw a particularly large increase in metro area poverty (it came in 4th on the Business Insider list), and witnessed a sharp rise in suburban poverty according to Brookings, with the number of suburban Census tracts with more than 20 percent poverty increasing from 32 in 2000 to 197 in 2008-2012. It’s silly to think that the Savannah metro area is immune from these trends, especially given the recent investments and ongoing trends in the greater downtown area. I’m going to keep arguing that Savannah will be a stronger city if we have more people living in the downtown area and that the city’s historic neighborhoods will be richer places to live if they are welcoming places to would-be residents of all income levels. ← Flooding on Abercorn Street (video): how can we minimize the damage?